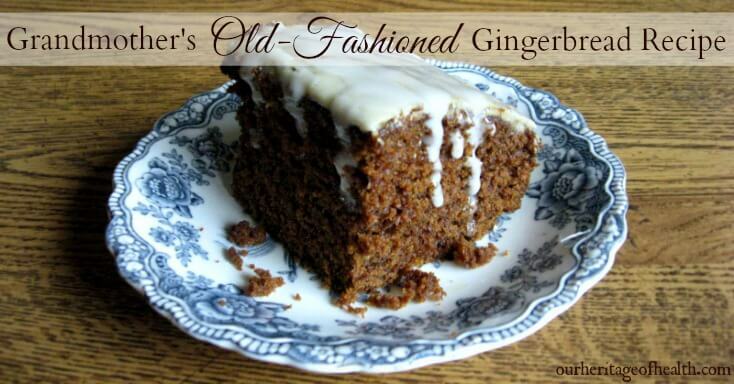 There are few dessert recipes that seem quite as traditional as old-fashioned gingerbread cake. Next to fruitcake and plum pudding, gingerbread is one of the quintessential old-fashioned desserts for the holiday season, but it’s also delicious at any time of the year. Even though we usually tend to think of gingerbread as a holiday dessert, in earlier centuries, gingerbread was often served for special occasions throughout the year, like Muster Day, for example. With gingerbread cake, though, all you have to do is pour the batter into a pan, pop it in the oven, and enjoy the heavenly spicy aroma as it bakes, so it’s the perfect solution for times when you want the flavor of gingerbread without the work of making cookies. I’m not sure exactly how old this particular recipe is because I found it in one of my grandmother’s old recipe boxes and there was no date on it. It was mixed in with several older-sounding recipes, though (like ones calling for lard and for yeast cakes rather than yeast packets), so I’m guessing that the recipe has a little bit of history to it at least even if it might not be quite as old as some of the 19th century recipes I usually make. 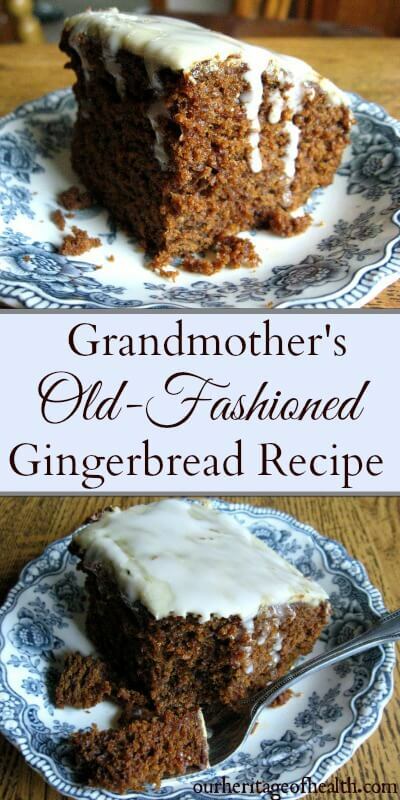 No matter how old might be, though, it has all the flavor of old-fashioned gingerbread recipes, and it’s going to be one of my favorite holiday traditions from now on! *Note: Usually I would recommend organic molasses, but the only molasses that I’ve been able to find is organic blackstrap molasses like this kind. If you don’t mind having a cake with a darker, less sweet flavor, then you might be ok with using the blackstrap, but if you like your cake to have a sweeter flavor, then the blackstrap molasses might make the cake too bitter. I used this regular molasses for making this recipe because it has a milder flavor and it’s also unsulphured and non-gmo. In a separate bowl, combine flour, baking soda, salt, and spices, stirring to blend well. Add molasses to hot water and stir to combine. Add the molasses mixture alternately with the flour mixture to the bowl with the butter, egg, and sugar mixture. Stir well to combine. Optional: Drizzle the top of cake with icing before serving. I didn’t write down the exact measurements I used (sorry! ), but I just poured some organic powdered sugar into a bowl (it was probably about a cup and a half, maybe? ), added a little splash of vanilla extract and a couple of spoonfuls of pure maple syrup (I like the darker syrup for stronger maple flavor), and then I added a few drops of water at a time, stirring until it was the right consistency for drizzling. I’m such a sucker for almost anything that contains molasses. It was just the way my mother baked all those old fashioned things that I’m sure were passed down for generations. This sounds so good that mine is already in the oven. One of the restaurants in our town leaves the gingerbread icing-less and serves warm with fresh whipped cream on top. Divine. Nothing better than grandmother’s cake, especially gingerbread one. My granny also used to make one, haven’t had one that would taste the same good since. Grandmother’s cakes are always the best! I wanted to mention that I had made this GF for Xmas (using Reddi-wip instead of the frosting) and it was… authentically rustic. Whoo boy! So I made it again for New Year’s sans cloves and used half of the molasses and it was more like a ginger spice cake. Really a bummer about non-organic molasses, though. I don’t trust any of ’em. I made my great (times 4) grandmothers recipe today and the ingredients are just about the same. No exact measurements; egg size ball of butter etc.. this one is dated about 1837. Probably the same time period. Hard to say how long the recipe had been around before this date. 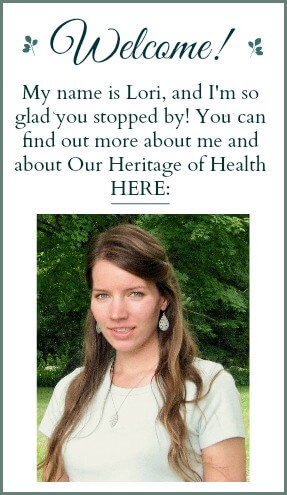 That’s really interesting, and it’s so neat that you have such an old family recipe from your four times great grandmother! I love the history of old family recipes. Made this for my husband as he loves gingerbread cake. He absolutely loved it. This is a keeper! Could this be made with spelt flour and treacle? I live in Europe and can get black treacle instead of molasses. Also, I’ve heard that a pinch of ground black pepper goes well with ginger spiced goodies, so I’ll try that. Yes, spelt flour should be fine, and treacle should be fine too. The only thing that might be a bit different is the sweetness level depending on how sweet your treacle is. I’m not completely sure how black treacle compares to molasses. I know that in America we have regular molasses and then we have blackstrap molasses, and the blackstrap is less sweet and has a more bitter flavor. So depending on how sweet or bitter your black treacle is you might want to add a bit more sugar if your treacle has a bitter taste at all. I left my cookbook at home while visiting friends and wanted to make gingerbread for them. Was looking on this site and found yours. I always see whipped cream served with it but my Mother always served her gingerbread with either lemon sauce or raisin sauce. Recipe almost the same. Hers came out of an old southern home comfort wood stove cookbook delicious! I love the idea of serving it with lemon sauce! Lemon and ginger go so well together!